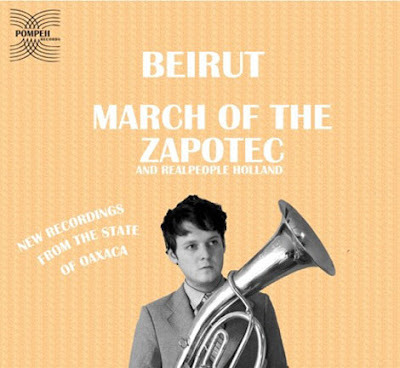 Although scheduled for a February 17th release, Beirut's two new EPs March of the Zapotec & Real People - Holland are available now on iTunes. Not sure whether this is a planned digital exclusive for iTunes a la Deerhunter, or some sort of Raconteurs-style iTunes screw up, but I know what I'm going to be listening to this morning. This is Zach Condon's first release on his own Pompeii Records distributed by Revolver in the U.S. Beirut played a secret show at Coco66 last night in Greenpoint and will also be playing two more NY shows at MHOW and BAM 2/4 and 2/6 respectively. Entitled March of the Zapotec, the first EP consists of songs written by Beirut and recorded in Mexico with the help of Oaxacan march masters The Jimenez Band. The second EP, Holland, showcases Zach's latest bedroom-style recordings under his former moniker Realpeople, including the previously released "Venice" (in the 2007 Believer music issue), and "My Night With the Prostitute From Marseille" (on the Natalie Portman curated Big Change charity album). Taken together, the two EPs proudly display the scope of Beirut's work over the last year. Meanwhile, we'll have a review of the two EPs next week. Stay tuned.